Monday Properties' 1000 Wilson Blvd., in Rosslyn, is now home to a green wall that measures 780 square feet and whose builder calls it "the green way to purify indoor air. " WASHINGTON — Monday Properties’ 1000 Wilson Blvd., in Rosslyn, is now home to the second-largest active green wall in the U.S.
Lothian, Maryland-based Greenstreet Green Walls was commissioned by Monday Properties for the wall. Greenstreet worked with Fox Architects and AgroSci to design and install it. The 780-square-foot wall — 66 feet wide, with a height that varies from about five feet to 19 feet — is more than just plants stuck in pots on a wall. The active green wall system recirculates air, water and nutrients to the plants’ root zone at a rate that forces the plants to actively perform their natural processes continuously. 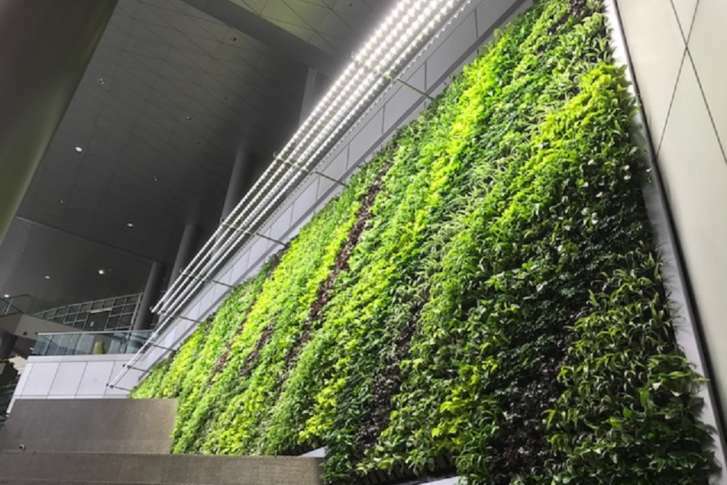 “A living wall brings nature inside for a cleaner, healthier and more welcoming space, and green walls are the green way to purify indoor air,” said Greenstreet Green Walls owner Ray Greenstreet. “Implementing innovative and original solutions to elevate the tenant experience has allowed Monday’s buildings to stay ahead of the curve. In this instance, the green wall is a perfect complement to our ongoing commitment to sustainable design with our LEED Gold certification,” said Monday Properties managing partner Tim Helmig. The largest active green wall in the U.S. was installed at Drexel University six years ago, in the lobby of the Philadelphia school’s Papadakis Integrated Sciences Building. The five-story wall is about 20 feet wide and totals 1,500 square feet.